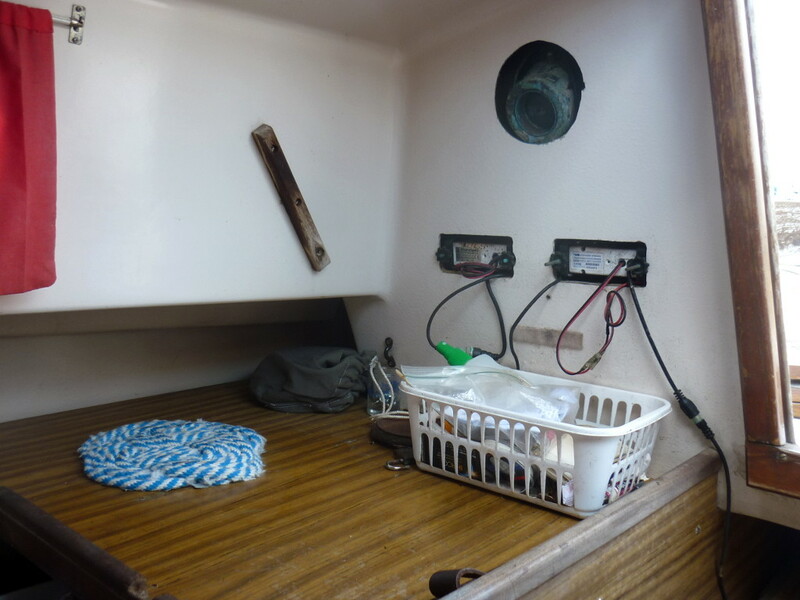 Valor is a well-worn but sound boat and is regularly sailed. Cape Dory Yachts built 843 of these boats between 1972 and 1982. They are known for sea-kindliness, easy handling and a wet ride. They are heavy displacement boats with a full keel, some cutaway in the bow. In my opinion, they are fine boats to learn to sail, stout enough to bump into things now and then, with light, easily managed sails. 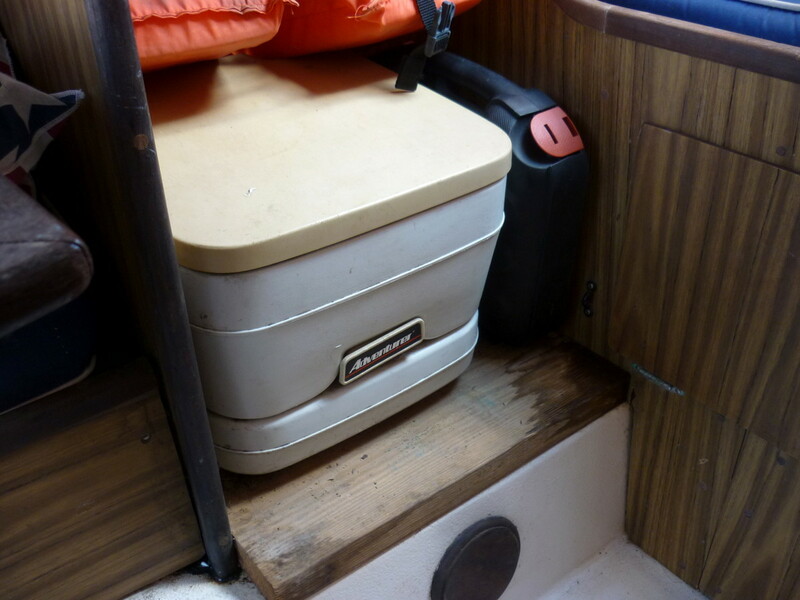 While the boat has three winches, I have found that sails can be set using the "armstrong" method. 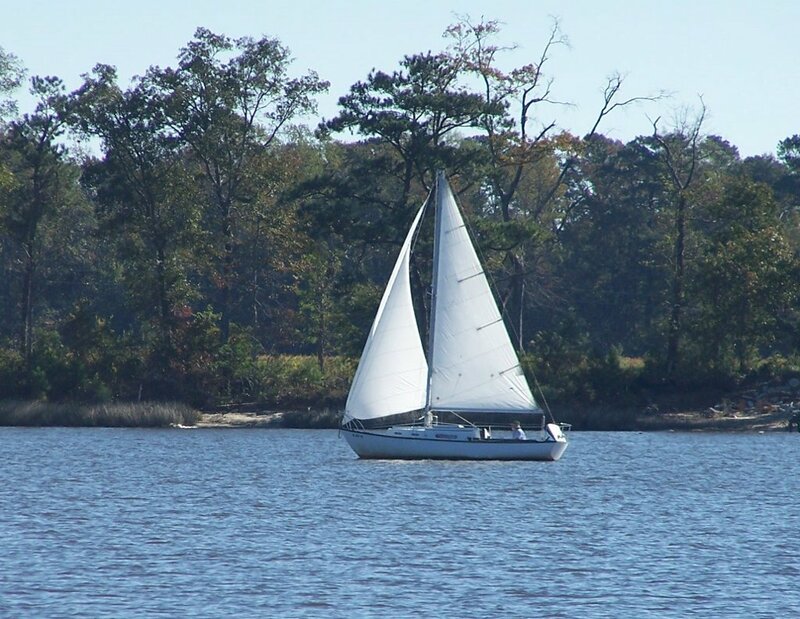 They make great daysailers because they can be set up and off the dock in a fraction of the time of a larger boat. The arrangement of outboard motor in well means the motor can be lifted out and carried to a shop for maintenance, much easier than crawling around a locker to change the oil. 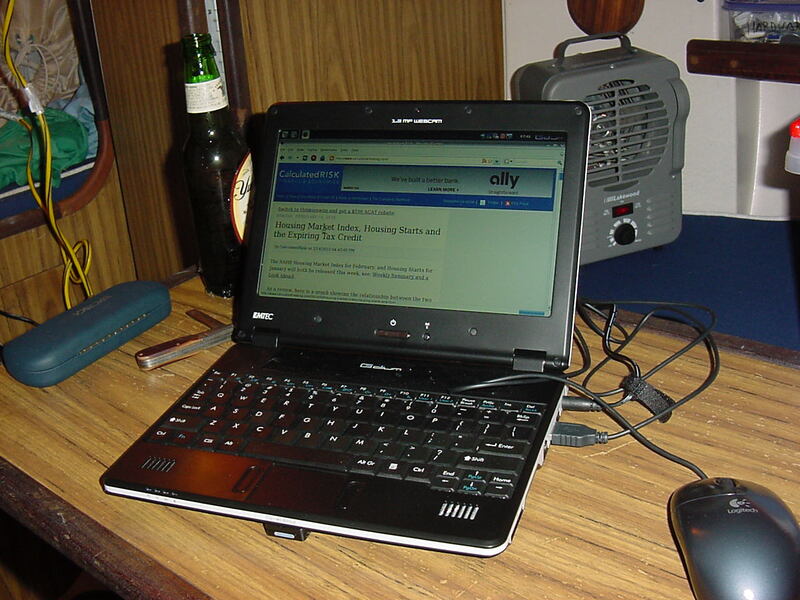 The cabin is big enough to "camp out" in for a few days, and I have taken trips all over the Pamlico Sound, the Neuse River and the ICW as far south as Prince Creek off the Waccamaw River in South Carolina. 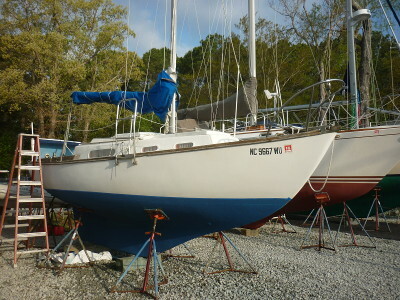 You want a small, easily-sailed boat that is quick to set up and get off the dock, for fair weather daysailing. You want a boat to keep in a marina rather than having to trailer it to a ramp and set up the rig for each trip. You want a boat that is economical to own, maintain, operate and insure. 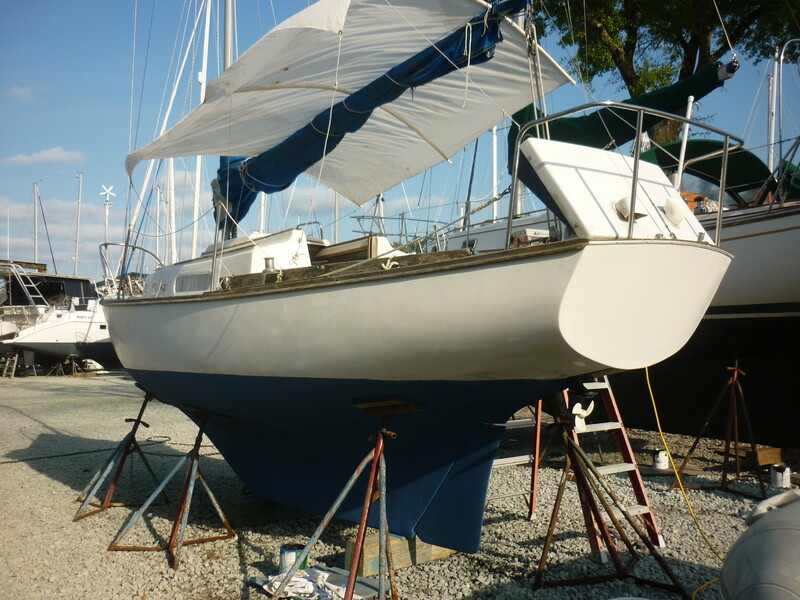 You have developed an interest in sailing but aren't ready to make the plunge to buy a large, expensive boat. 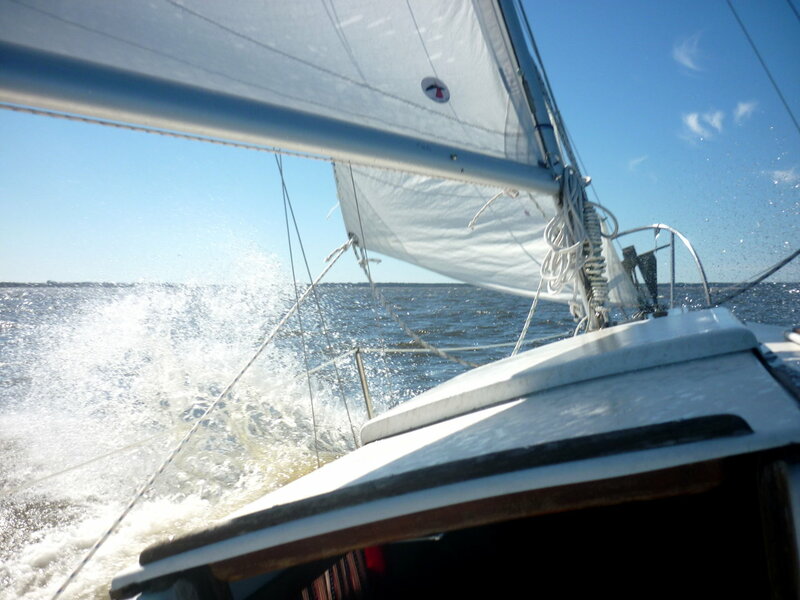 You'd like to find out first if you really like sailing. 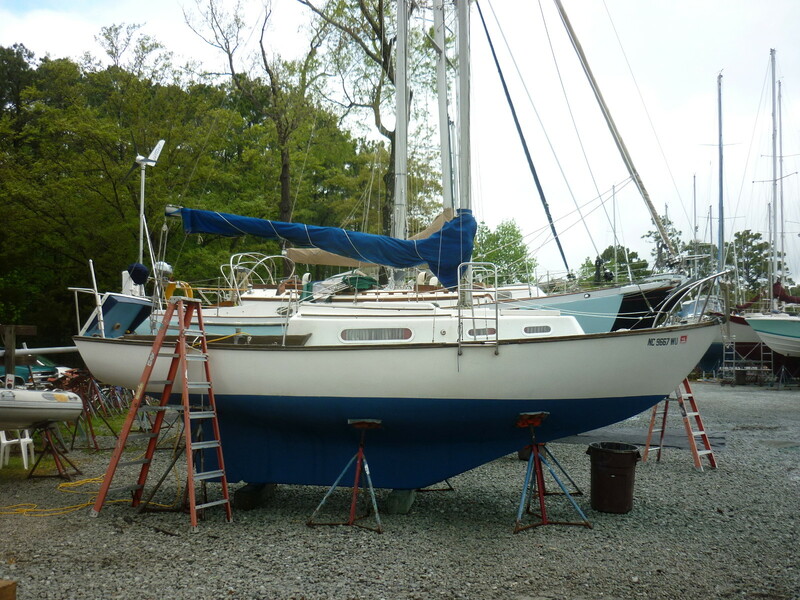 You haven't done much sailing yet and would like to learn and gain experience on a forgiving, easy-to-sail boat before moving on to a bigger one. 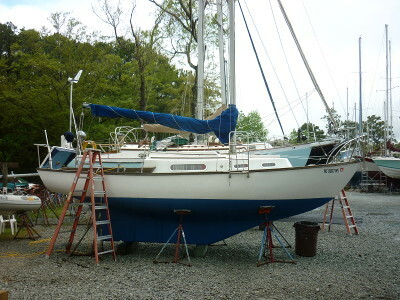 You would like to keep a boat at a summer home for the family to sail on vacations. 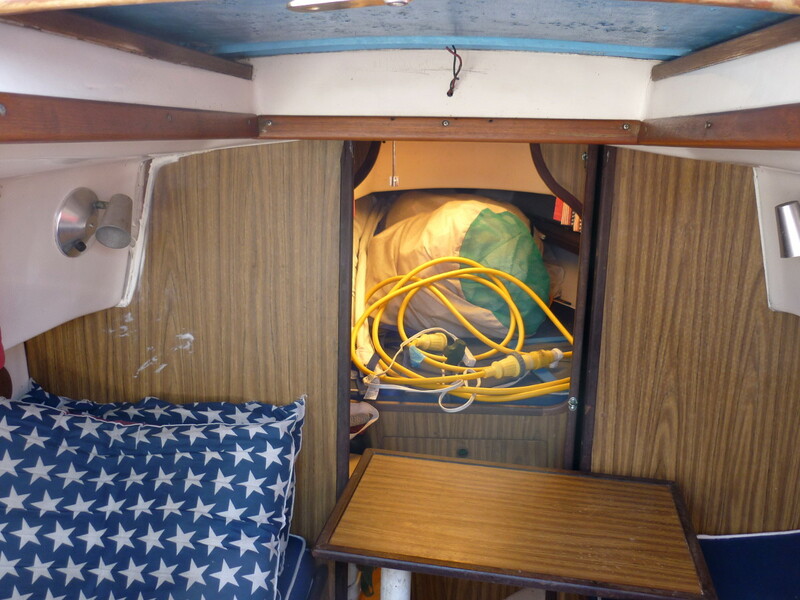 You have limited means but a passion for sailing and want a boat that will cruise the sounds and waterways, that you can camp out on for days on end, that will go as far as you want to go. You are looking for a comfortable, roomy floating condominium for enjoying the marina lifestyle. 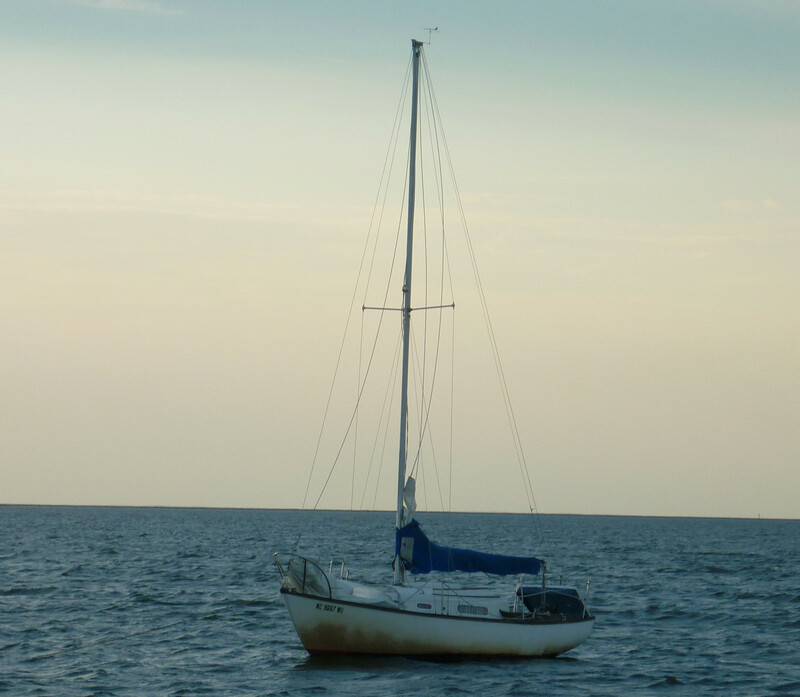 You prefer to motor rather than sail. You want to do blue water cruising. 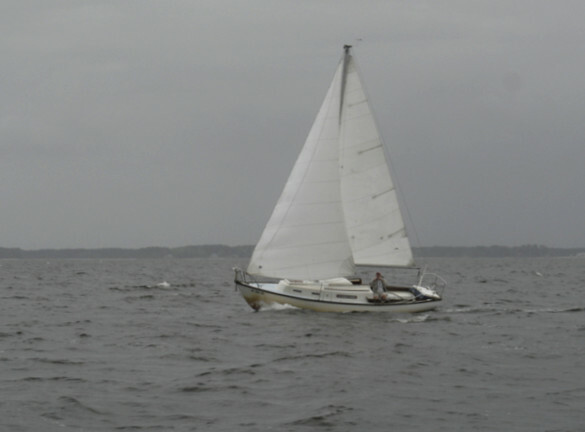 Valor sails on the Neuse River in moderate airs. 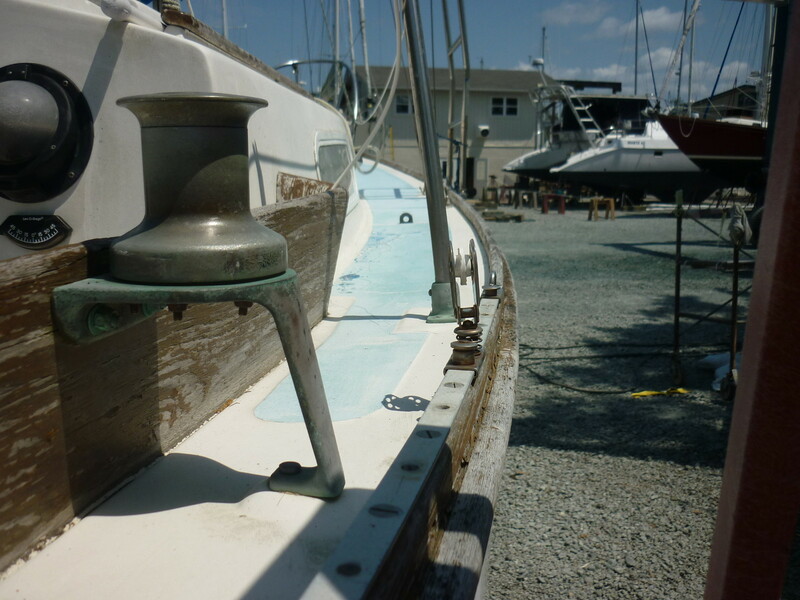 Kicking up a spray close-hauled. Sailing in Clubfoot Creek under light airs. On the hook in West Bay. May 2016 Haulout at Sailcraft Services, Oriental NC. 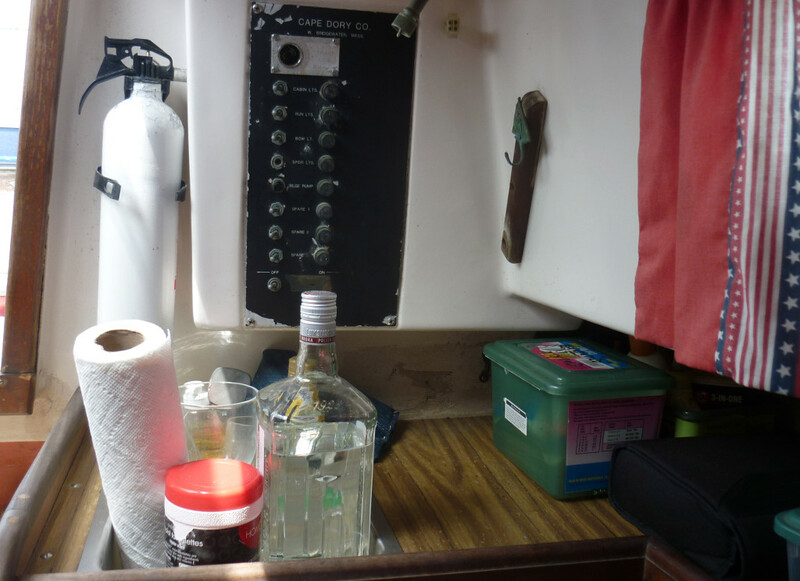 Counter and sink on port side. 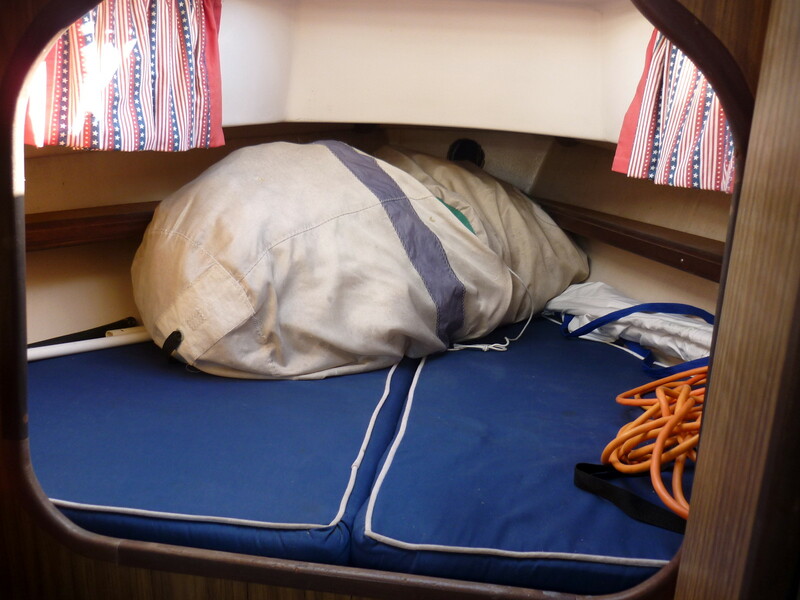 View forward of the v-berth, with bagged jib and genoa. 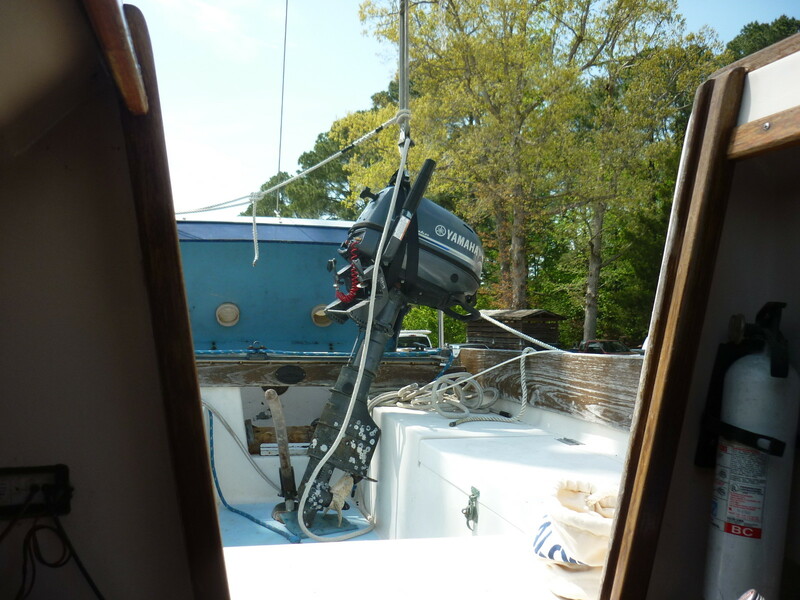 Side deck and teak, May 2016. Lifting the motor out of the well on the main sheet, May 2016.